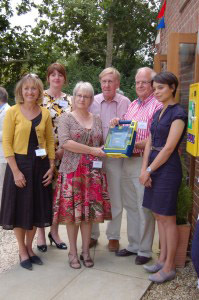 The small rural community of Pickworth achieved ‘First Aid Gold’ when Dr Emma Egging whose husband Jon, a Red Arrows pilot who tragically died whilst flying in an air display over Bournemouth in August 2011, officially unveiled and launched their Community Public Access Defibrillator Scheme on Saturday 28 July. Over 50 residents and other invited guests, including Cllr Martin Hill OBE, Leader Lincolnshire County Council, representatives from The Community Heartbeat Trust, East Midlands Ambulance Service, Lincolnshire Police, Community Lincs and Shield First Aid & Safety Training celebrated the significant occasion. The Appeal to fund the scheme to establish a Public Access Defibrillator, available 24/7, was launched in March 2012 by six residents who shared a common belief in having potential lifesaving equipment to hand in the event of a resident (all ages), visitor or passer by suffering a Sudden Cardiac Arrest. The required £2000 was raised by way of resident donations by week one May, a substantive illustration of support for the concept. Statistics suggest the survival rate after a Sudden Cardiac Arrest is raised from 5% using Cardiopulmonary Resuscitation (CPR) alone, to 50% when a Defibrillator is readily accessible and used. The scheme established in Pickworth is fully endorsed by the East Midlands Ambulance Service as it affords a more rapid response time by members of a community being able to get a Defibrillator to an emergency before ambulance paramedics can arrive having been activated by dialing 999. The automated Defibrillator is located in a Lock Box located on an external wall of Pickworth Village Hall and accessed by a key pad code – all residents were offered training in CPR & Defibrillator awareness prior to the scheme going live by Shield First Aid & Safety Training www.shieldfirstaid.co.uk on behalf of The Community Heartbeat Trust. Cllr Martin Hill commended the project team and community for establishing the first scheme of its type in Lincolnshire and hoped other villages would follow the example set – residents of Sapperton and Folkingham have already expressed an interest. He further commented on just what small communities can achieve if they define a common purpose and goal, and work in harmony to achieve a positive outcome – an excellent illustration of self-sufficiency. The Pickworth Project Team worked closely in conjunction with The Community Heartbeat Trust www.communityheartbeat.org.uk, an organisation dedicated to placing public access defibrillators in rural locations such as Pickworth. EMAS (East Midlands Ambulance Service) have also endorsed the scheme given the rapid response time using this equipment prior to paramedics being able to reach the emergency. Members of the Pickworth team hope that other Lincolnshire communities consider the merits of adopting a cPAD scheme themselves. Pickworth is a small village in South Lincolnshire, experiencing, like many others, rapid and profound change. Set in agricultural surroundings, few of its people now have any direct connection with farming, and its local services (school, post office, shop) have long disappeared. How is the experience of community to be sustained and developed in the face of such changes? The Pickworth project is addressing this question by exploring the heritage of the village and the surrounding area - its landscape, people and built environment as they have evolved over the centuries to the present day. Local people are involved in events designed to encourage interest in the past and concern for the future of the village. The project started with a ‘launch event’ which brought in people from a wide area who had connections with Pickworth. It is continuing through studies of village life at various times, through oral history, documentary records, farming, landscape and wildlife. Events and activities such as field walking, workshops and a village walk are planned, and local residents are encouraged to contribute in aspects that particularly interest them. A ‘Book of Pickworth’ and an accompanying DVD will be produced, and a plan of the graves in the churchyard together with details of the graves will be made available to the church. Records and documents relating to this work will be conserved after the closure of the project.